The Columbia Series 770 vinyl window is an affordable fully welded vinyl window system designed with both the home-builder and the home owner in mind. The Columbia Series 770 vinyl window is a traditional configuration providing two operating sashes with weight-regulated balances. This assures smooth operation and enhanced ventilation, and allows for easy and safe outside-glass cleaning from inside the home. Available in Standard and Oriel formats Mutins, where chosen, are mounted within nominal 7/8″ insulated glass to facilitate glass cleaning. The Columbia Series 770 vinyl window is a high quality affordable choice for new construction or replacement windows. General: Windows shall be fiberlux series 770 vinyl window. 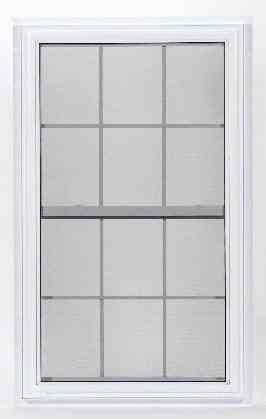 Double hung vinyl window shall meet or exceed ASTM D4099 grade 30.